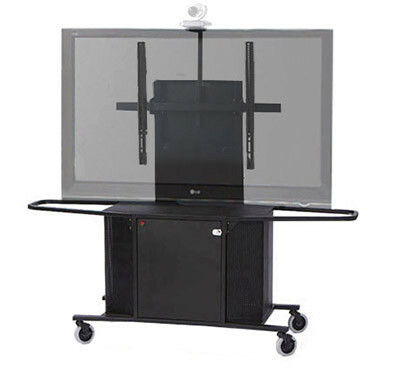 The MC1000 Video Conference Cart and the MC-XL display mount are the perfect combination for your video conferencing mobility needs. Up to 14RU rack rails for mounting electronics are accommodated by the cart's large interior while the perforated side panels and optional fan provide interior airflow. The metal cart’s adjustable TV and camera mount system allows you to mount your choice of video conferencing system or monitor(s). The mount system also accommodates 50”-90” displays. Ideal for educational, teaching, business, military, courtroom and corporate training environments, this mobility pair delivers durability and versatility.